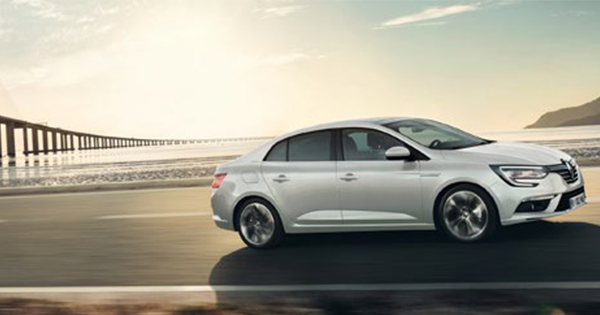 Renault is extending its C-segment line-up with the arrival of all new MEGANE Sedan in the MEGANE range. All new MEGANE Sedan boasts dynamic styling underscored by a broad panoramic glass roof, unique to the segment. Benefitting from the CMF C/D architecture, all new MEGANE Sedan is equipped with features from the segment above for enhanced comfort and driving pleasure. After the reveal of new MEGANE in 2015 and new MEGANE Estate in March 2016, all new MEGANE Sedan is the latest model in the MEGANE family. The new four-door sedan is part of the renewal of the Renault range. Its dynamic and prestigious styling is reflected in sculpted surfaces, well-balanced proportions, a Renault-family front end, and a distinctive C-shaped front light signature. The glass roof linking the windscreen to the rear window lends an elegant and esthetic two-tone look. All new MEGANE Sedan boasts top-level rear-seat spaciousness. The new model’s three-box body also benefits from a capacious trunk (508 dm3 VDA) with easier access thanks to the hands-free Easy Trunk Access system. All new MEGANE Sedan benefits from the cost-cutting CMF C/D architecture CMF C/D architecture (Common Module Family) and brings motorists the same driving pleasure and superior features as the rest of the MEGANE family, including a 7-inch color TFT digital counter, an 8.7-inch I-surface multimedia tablet, R-LINK 2, MULTI-SENSE, a color head-up display, Easy Park Assist and an extensive line-up of additional comfort equipment and driving aids (Advanced Emergency Braking System, Lane Departure Warning, etc.). All new MEGANE Sedan meets the expectations of customers looking for a stylish vehicle with refined features. Depending on the country, the engine range comprises two gasoline engines: – the SCe 115, available with a 5-speed manual gearbox or a continuously variable transmission (CVT), – and the TCe 130, available with a 7-speed dual-clutch EDC automatic gearbox or a 6-speed manual gearbox. Three diesel engines are available, also depending on the country: – the dCi 90, available with a 6-speed manual gearbox, – the dCi 110, available with a 6-speed manual gearbox or the EDC6 dual-clutch automatic gearbox, – and the dCi 130, available with a 6-speed manual gearbox. All new MEGANE Sedan will be produced at the Bursa plant in Turkey and sold in more than 20 countries around the world.